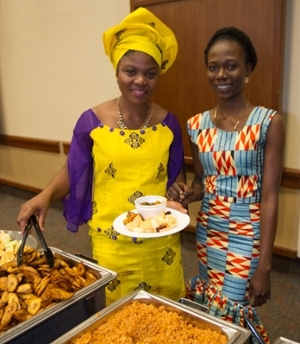 Some of the food, attire and customs from African countries were transported Saturday, Feb. 20 to Southern Illinois University Edwardsville. 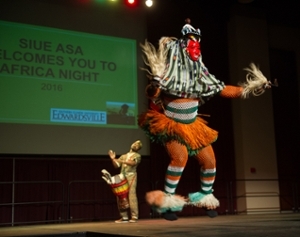 The SIUE African Student Association (ASA) hosted Africa Night in the Morris University Center as approximately 130 people enjoyed music, food, dance and drama. 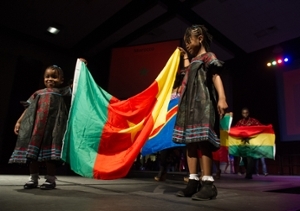 “The broad range of diversity on the African continent, and how it was captured during the night was impressive,” said Prince Wells, faculty advisor for ASA, director of the SIUE Black Studies Program and associate professor in the Department of Music. 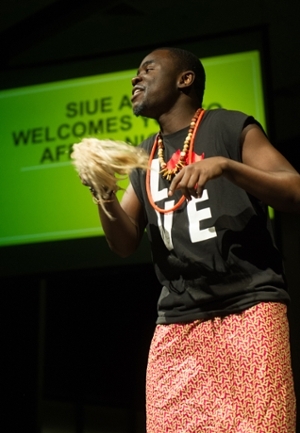 Some of the performances were presented by the professional dance company Afriky Lolo, Washington University Yori Yori Dancers and the SIUE ASA Dancers. Performing for the Afriky Lolo are Caph Guei, drummer; and Diadie Bathily, dancer. 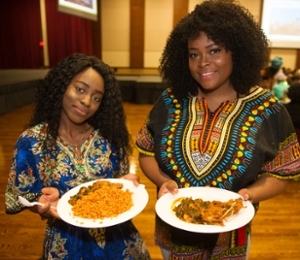 L-R: Ololade Mustafa, vice president of the SIUE African Student Association (ASA); and attendee Olajumoke Abass. L-R Tomi Oyinloye, a senior mechanical engineering major; and Nwadiuto “Alison” Okeke, junior electrical engineering major. One of the events of the night was the Parade of Flags. 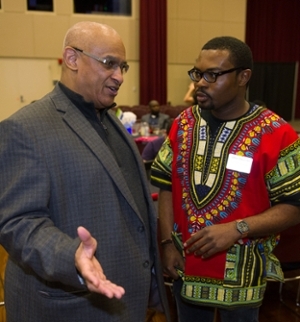 L-R: Enjoying the evening were Prince Wells, director of the SIUE Black Studies Program and associate professor in the Department of Music; and Uzezi Oduaran, president of ASA and teaching assistant in the Department of Geography. Entertaining the crowd as a storyteller was Ekemini Akpan, a senior bio medical sciences major.